The Serial CAN BUS provide your Arduino or others MCU with the capability to communication to CAN Bus, such as hacking your vehicle. CAN Bus is a common industrial bus because of its long travel distance, medium communication speed and high reliability. This Serial CAN Bus module is based on MCP2551 and MCP2515, which can provide speed up to 1Mb/s. Work with Arduino/BeagleBone board/Pi or any MCU that integrated with Uart. 120Ω registor, default connected, if you don't need you cut this pad with a box cutter. There's a jumper on the back side, please connect the pads together with a soldering iron. And VCC must connect to 5V. Please try as below, and please note that VCC till need to connect to 5V. 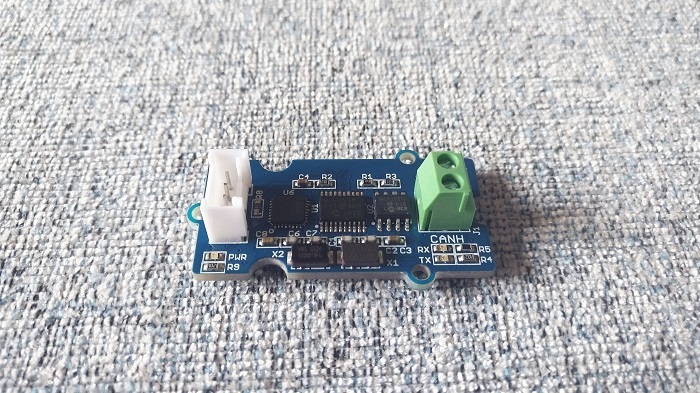 You can achieve the complete function of this Serial CAN Bus module with only a few AT command. You can set the serial baud rate of the module with this command. There're 5 rates available, up to 115200 b/s. You can use this command to set the rate of CAN Bus, there's 18 rates available. Normally, if you want to hack your vehicle, 500k is the right one. There're 2 Mask for the module, Mask0 and Mask1. Neeed 8 bit of character, hexadecimal. When the module working on Normal mode, you can send and recevie data from CAN Bus. We provide an library for Aruino Software Serial.